Winter weekends have become my time to dive into the kitchen and whip up a whole bunch of goodness. Nigel will never shy away from a freshly baked cake, allowing me to try new recipes as often as I like (winning!). The winter spices are some of my favourite - cinnamon, ginger, nutmeg and cloves - and this cake is a perfect fusion of those, and then some. 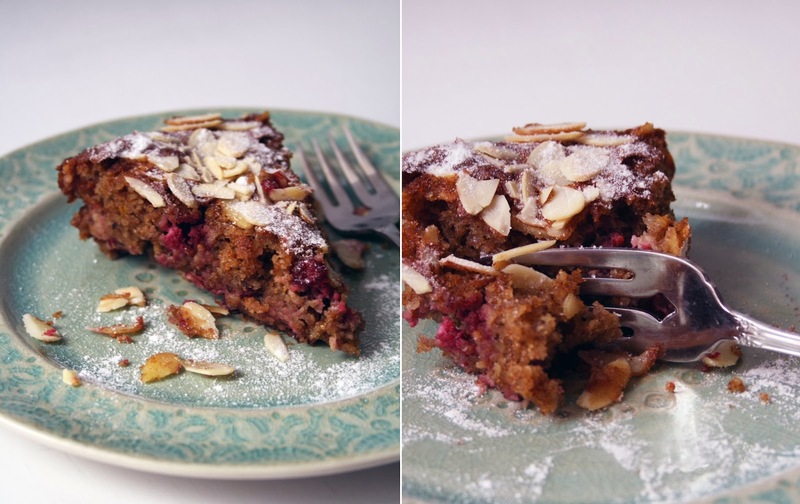 The orange zest and tart cranberries add a perfectly balanced zing to the recipe, and the almond flour gives the cake a light and airy texture. The cake was delicious with a cup of coffee as an afternoon treat, and I think it would go equally well at the end of a nice meal. Either way, you can't go wrong with fresh baked goods in the house. *Note: I didn't have powdered sugar on hand, but it can easily be made at home. Simply combine 1 cup of granulated sugar with 1 tsp of corn starch in a magic bullet and pulse until combined. In a large bowl, combine the flour, brown sugar, spices, baking powder and soda. In a separate bowl, melt the butter. Add the eggs to the melted butter and whisk well. Continue to add the orange juice and zest. Fold the wet ingredients into the dry, and mix to combine. Add the cranberries and mix one last time. Pour the batter into a well greased 9"round baking pan, and sprinkle the almonds on top. Bake for roughly 30 minutes, until a toothpick comes out clean. Note that the cake might be more moist then usual, do not confuse that with being raw. Remove from oven and allow to cool for at least 15 minutes before sprinkling with powdered sugar.